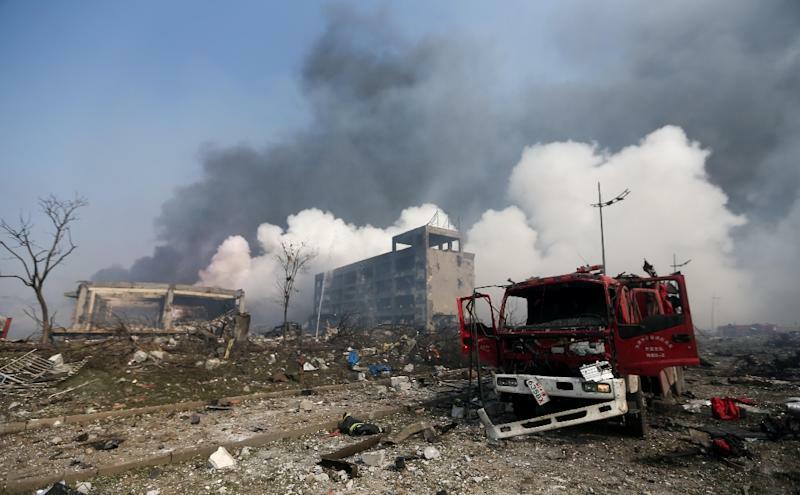 Tianjin (China) (AFP) - A Chinese military team of nuclear and chemical experts began work Thursday at the site of two massive explosions in the city of Tianjin, state media said, as pressure grows for authorities to explain the cause of blasts that left 50 dead. 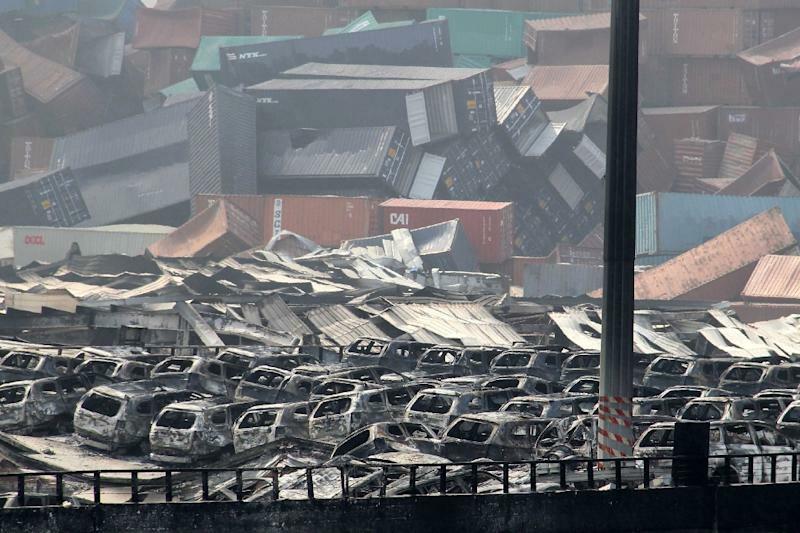 The detonation at a chemical warehouse in the major Chinese port city also injured more than 700, according to official media, leaving a devastated landscape of incinerated cars, toppled shipping containers and burnt-out buildings. The 217-strong group of military specialists tested the air around the site for toxic gases, with rescue teams ordered to wear protective clothing in the vicinity due to the ongoing risk of leaking poisonous chemicals, the official Xinhua news agency reported. Rescuers were attempting to remove 700 tons of deadly sodium cyanide from the area late Thursday, Communist Party newspaper the People's Daily reported. A lack of answers as to what caused the blast 24 hours on has reinforced questions about standards in the country, where campaigners say lives are sacrificed on a lack of respect for safety and poor implementation. Citing rescue headquarters, the official Xinhua news agency said 50 people had been killed, including at least 12 firefighters. An AFP reporter in Tianjin in the early hours of Thursday saw shattered glass up to three kilometres (two miles) from the site of the blast, which unleashed a vast fireball that dwarfed towers in the area, lit up the night sky and rained debris on the city. "When I felt the explosion I thought it was an earthquake," resident Zhang Zhaobo told AFP. "I ran to my father and I saw the sky was already red. All the glass was broken, and I was really afraid." The blast site sits in a giant logistics hub more than twice the size of Hong Kong. It hosts auto plants, aircraft assembly lines, oil refineries and other service and production facilities. The explosion was felt several kilometres away, even being picked up by a Japanese weather satellite, and images showed walls of flame enveloping buildings and rank after rank of gutted cars at an import facility. Paramedics rushed the injured on stretchers into city hospitals as doctors bandaged up victims, many of them covered in blood. At one city hospital a doctor wept over a dead firefighter still in uniform, his skin blackened from smoke, as he was wheeled past along with two other bodies. Xinhua said 701 people were hospitalised, 71 of them in critical condition. Mei Xiaoya, 10, and her mother were turned away from the first hospital they went to because there were too many people, she told AFP. "I'm not afraid, it's just a scratch," she said pointing to the bandage on her arm. "But mum was hurt badly, she couldn't open her eyes." The blaze that followed the blast was brought "under initial control" on Thursday afternoon, Xinhua cited the public security ministry as saying, after 1,000 firefighters and 143 fire engines had been deployed to the site. Xinhua described the facility as a storage and distribution centre of containers of dangerous goods, including chemicals. Executives from the storage centre's owner, Tianjin Dongjiang Port Rui Hai International Logistics, were taken into custody by police, it said. State broadcaster CCTV said that President Xi Jinping had urged "all-out efforts to rescue victims and extinguish the fire". On Thursday, UN Secretary-General Ban Ki-moon said he was "deeply saddened to learn of the loss of life and the injuries to scores of people". China has a dismal industrial safety record as some factory and warehouse owners evade regulations to save money and pay off corrupt officials to look the other way. In 2013, a pipeline explosion at state-owned oil refiner Sinopec's facility in the eastern port of Qingdao killed 62 people and injured 136. 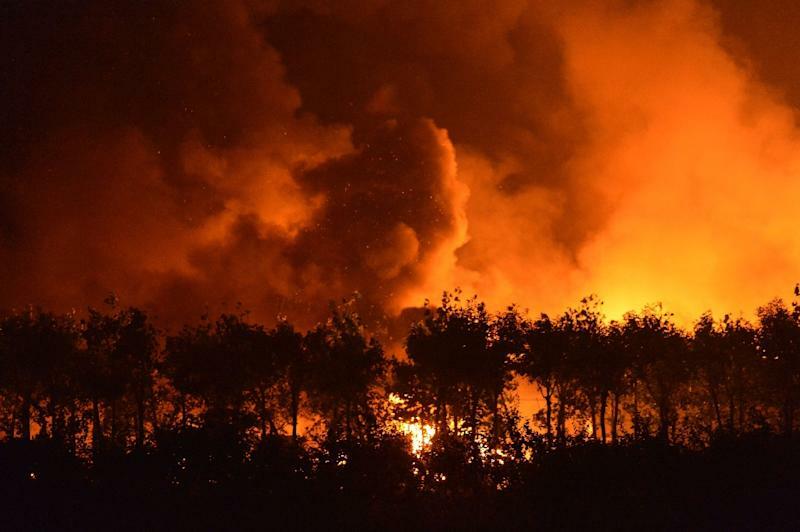 In July this year, 15 people were killed and more than a dozen injured when an illegal fireworks warehouse exploded in the northern province of Hebei, which neighbours Tianjin. And 146 were killed in an explosion at a car parts factory in Kunshan, near Shanghai, in August last year. Tianjin, about 140 kilometres (90 miles) southeast of Beijing, is one of China's biggest cities with a population of nearly 15 million people, according to 2013 figures.